The majority of isolators are decontaminated using hydrogen peroxide vapour technologies, but limitations in process control, aeration efficiency, and product compatibility have led to research into new decontamination methods. DNA in mammalian cells is degraded via single-strand breaks upon exposure to nitrogen dioxide, which is now being developed as a sterilant. New decontamination technology based on NO2 gas promises many benefits. James Rickloff, David Opie and Evan Goulet look at the specific advantages for decontaminating isolators used in aseptic manufacture. Isolators are an important part of any life science company’s manufacturing and QC processes. These sealed areas are used both to produce and test pharmacopeial products in a decontaminated, “germ-free” environment. Sterilant generators were developed in the late 1980s to provide for a more effective and validated decontamination process to control microbiological contamination in these aseptic processing areas. The majority of isolators in use today are decontaminated using hydrogen peroxide (H2O2) vapour technologies. However, limitations in process control, aeration efficiency, and product compatibility, especially with protein-based drugs, have led to research into new decontamination methods. DNA degradation is an effective mechanism of inactivation in micro-organisms. 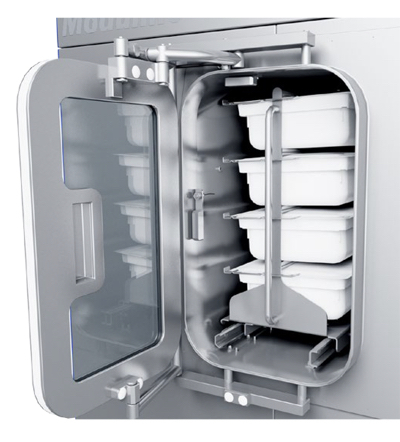 In recent years, this antimicrobial property has been shown to extend to a wide variety of micro-organisms, including viruses, spores, yeasts, moulds and myco-bacterium. This broad range of efficacy permits NO2 to be used as a sterilant. It has been established that Geobacillus stearothermophilus is the most resistant organism to the NO2 sterilisation process. This organism is already the challenge organism used to make biological indicators (BIs) for steam and H2O2 sterilisation processes. Now, BIs for the NO2 process will use this same organism. BIs exposed to the NO2 process exhibit a log-linear population reduction as exposure time increases. This predictable log-linear response is critical when establishing and validating decontamination cycles. An example of this behaviour is shown in Figure 1. In this graph, the BIs each had roughly one million spores of G. stearothermophilus. 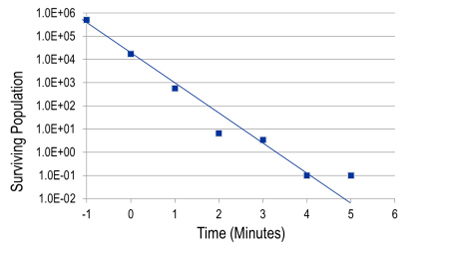 Several BIs were placed in a chamber for NO2 exposure, where the NO2 concentration was 3.5mg/L, the relative humidity was 75%, and the time of exposure was varied (see Figure 1). By increasing the relative humidity during the NO2 sterilisation process, the measured lethality rate can also be increased. This is due to spore coat hydration, which scales with increasing humidity. For example, decontamination of isolators and glove boxes can be achieved with an exposure time of about 60 minutes with 60–65% relative humidity. NO2 has clear advantages as a sterilant, with a key property being its low boiling point (21°C). By comparison, the boiling point of H2O2 is 150°C. The low boiling point of NO2 reduces the amount of sterilant condensation that occurs on the surfaces, which is observed with H2O2 processes. For rapid aeration at the completion of an exposure cycle, minimal condensation is an advantage. In the event that NO2 condenses (or is adsorbed) on a surface, it will evaporate much more quickly than H2O2. The materials that are compatible with NO2 include most polymers, stainless steel, and glass. However, there are several materials that should not be used in the construction of isolators or as isolator contents during the NO2 decontamination cycle. These materials are listed in Table 1, together with associated alternative materials that may be used. Most non-cellulosic packaging materials are compatible with NO2, including Tyvek and polypropylene wraps. The decontamination of an isolator relies on a sterilant generator system that controls the NO2 and humidity in the recirculating gas stream flowing through the isolator. For this application, the Accel NO2 Gas Decontamination System is being developed and marketed by Sterilisation Technology Group (STG) in conjunction with Walker Barrier Systems (New Lisbon, WI). This generator will be used for decontam-ination of sterility and bioburden testing isolators, clinical-scale manufacturing isolators, and large-scale production isolators along with pass-through chambers, biological safety cabinets, cleanrooms, or any other sealable enclosure requiring decontamination prior to use. The generator will either be integrated into new isolators or it can be provided as a stand-alone (portable or non-portable) unit for retrofit onto existing isolator systems or other sealed enclosures. For retrofit applications, a technical services team will initially perform a thorough materials evaluation. If the retrofit appears feasible, STG will work with the enclosure vendor and the client to discuss equipment/controls integration and validation methodologies. The Accel generator provides the means of humidifying the environment under controlled conditions prior to delivering a specific dose of sterilant at or near ambient temperature. The generator unit has the capability to control and document the Relative Humidity (RH), sterilant delivery, and cycle exposure times accurately to user-specified levels. It will also have sufficient capacity to handle 150ft3 (4.25m3) of internal volume under turbulent or unidirectional airflow conditions using a single dose of sterilant to the enclosure. Larger enclosures can be decontaminated using either a lower gas concentration and/or multiple doses of the sterilant during the cycle. The enclosures must have the means to aerate themselves via external exhaust or sterilant scrubbers following their decontamination. Preliminary testing has been completed using an NO2 generator connected to a fully loaded three-glove Transfer Isolator. The testing demonstrated the ability of NO2 gas to sterilise Apex Biological Indicators (Mesa Lot H2761) that were distributed throughout the isolator and a sterility test load. 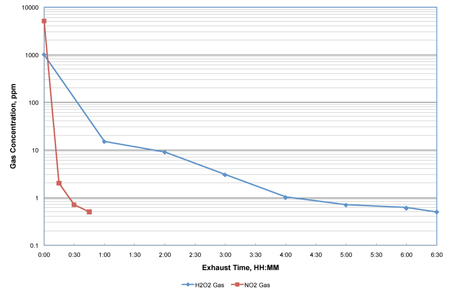 Sterilisation of the BIs with NO2 gas was completed with an exposure time that was comparable to that of H2O2 under the same loading conditions. While the demonstrated lethality was the same as with H2O2, a dramatic reduction in aeration time was achieved. The aeration portion of the NO2 decontamination process was reduced by as much as 85% on the loaded isolator when compared with the H2O2 vapour technology (see Figure 2). Dräger detector tubes were used to monitor the gas concentration at various exposure times for both technologies. It is important to note that the rate of air exchanges during aeration were the same for both the NO2 and the H2O2 tests. The reduced aeration time with the NO2 process will result in increased productivity. When using H2O2 decontamination, large production isolators can require several hours to a few days to achieve the necessary removal of sterilant residuals. This results in costly production delays. The NO2 decontamination process will allow production isolators to be returned to service in a much shorter timeframe, thus increasing the overall manufacturing throughput. In summary, a new sterilisation technology has been developed that will yield rapid aeration times, resulting in greater productivity and cost savings. This NO2-based system has similar decontamin-ation efficacy results as H2O2 vapour. The sterilant generator for the NO2 process can be used in a manner similar to the H2O2 generators, attached to new isolators or retrofitted to existing isolator systems. 1. Nitrogen dioxide induces DNA single-strand breaks in cultured Chinese hamster cells; Goersdorf, et al. ; Carcinogenesis (1990) 11(1): 37–41. 2. DNA strand breaks caused by exposure to ozone and nitrogen dioxide; Bermúdez, et al. ; Environ Res. (1999) 81(1): 72–80. 3. Effects of temperature and relative humidity on biological indicators used for ethylene oxide sterilisation; G. S. Oxborrow, A. M. Placencia, and J. W. Danielson; Applied and Environmental Microbiology (impact factor: 3.69). 03/1983; 45(2): 546–9. 4. Application of gaseous ozone for inactivation of Bacillus subtilis spores; Ahmet Aydogan & Mirat D. Gurol (2006): Journal of the Air & Waste Management Association, 56:2, 179–185. James Rickloff, MS, is a partner and scientific director of Sterilization Technology Group; David Opie, PhD, is vice president of R&D of Noxilizer; and Evan Goulet, PhD, is technical applications manager of Noxilizer.